4 5/8 Inch Tall French Door or Cabinet Slide Bolt Latch (Oil Rubbed Bronze) - measures 1 3/4 inch long and 4 5/8 inch tall (not including slide bolt). 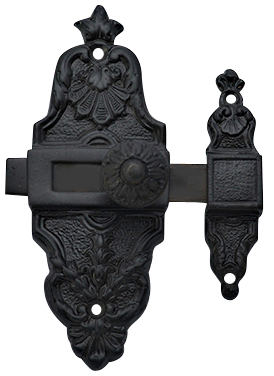 Latch piece measures approximately 3/4 inch wide and 2 7/8 inch tall. Mounts with four wood screws (included). Available in Polished Brass, Antique Brass and Oil Rubbed Bronze (shown). Oil Rubbed Bronze is a true living finish and will change with wear and time.